5 things you can do in under a minute to be instantly healthier. Each of these things takes only seconds but the health benefits of doing these regularly are HUGE. Everyone can spare a few minutes each day for the things on this list - just do it - you are worth it!! 1. 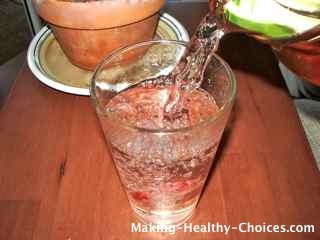 Drink a Glass of Water in the Morning: Room temperature and on an empty stomach. First thing in the morning before ingesting anything else, it's like a shower for the INSIDE of your body. Do this regularly and enjoy the benefits of the energy this will give you - so much better than a cup of coffee in the morning!! Your bowels will love you too as this will help your body with elimination. Click here to read more. 2. Dry Skin Brushing: Your skin will LOVE you! It's the biggest organ of your body and brushing it with a natural bristle skin brush will increase its health and functionality. You will feel energized as well and your skin will glow with radiant health if done regularly. 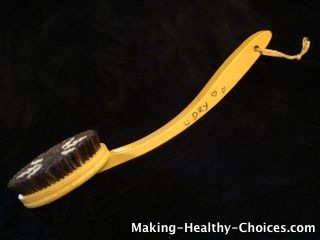 It takes under a minute to brush your entire body, click here to read more. you risk re-ingesting them. Click here to read more. 4. Take a Deep Breath: Fill your body with oxygen, do this often! Use the full capacity of your precious lungs! Oxygen is essential to our healthy life - breathe in fully to feed your cells. And exhale completely to create space for your next deep breath. As you move through your day, whenever you remember, take a nice long deep breath. This only takes seconds and the benefits to your mental and physical health and immeasurable! 5. Jump on a Rebounder: Don't have a rebounder? No problem, get up and do some jumping jacks, run on the spot or just move and shake your body for a few seconds or for a minute. Our bodies are meant to move. You don't need a ton of time, a special place, or special equipment to do this. Simply stand up and move your body and have fun with this one. Swing your arms, touch your toes, do a cartwheel, spin around, jump up and down, jog on the spot, dance, shake your entire body .... whatever feels right to you in that moment. Take a few seconds to do this in the morning and throughout the day. Every thing on the above list is easy to do and will only take a few seconds of your time ... and really there is no better way to spend your time than on things that will enhance the rest of your day. except the dry skin brush thing. Need to find one of those! Thanks Nadia! Great little website! Thank you, thank you. This is just the thing I needed to read today. I am feeling so overwhelmed with feeling fat and sick. I want to get healthy but everything seems so hard to do. These things on your list I KNOW I can DO!! And I know I can do these every day. Its a small start for me but its a start. Thank you.